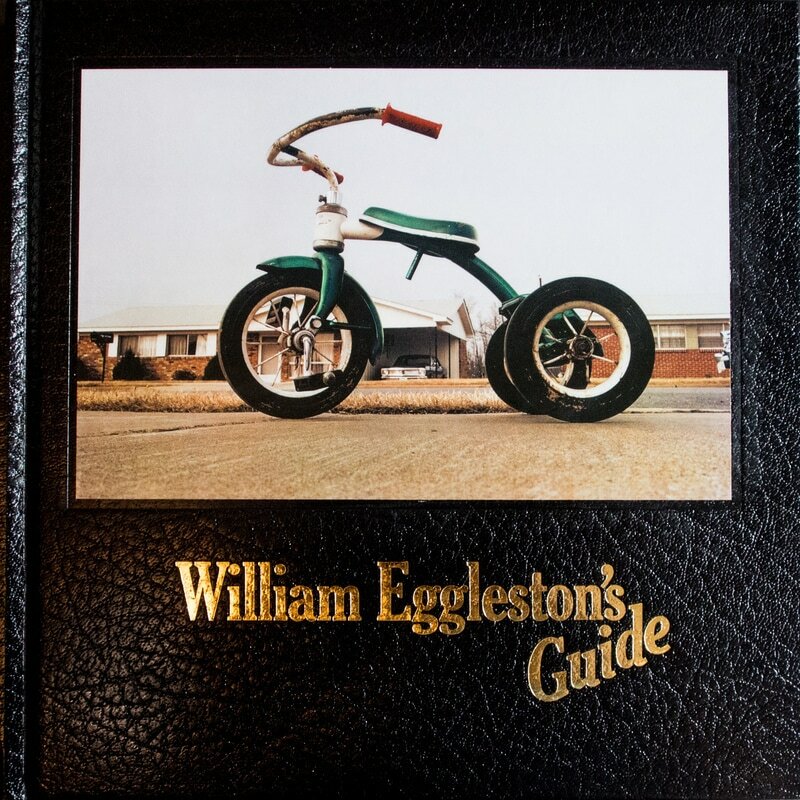 William Eggleston is an interesting photographer in that he really polarizes the art photography community. The battle is really rooted in the definition of art photography and its reaction to color. Color photography has been around a very long time with early attempts dating back to the 1930's however it was very expensive. Printing in color was also very limited so fine art really matured in the black and white genre. This gives us a separation between what we see on a daily basis, and the monotone interpretation of those scenes. You can see Eggleston running around Old Miss with his Leica, a gift from a friend, using modern color and black & white film. He develops his skills to the point that in 1969 he sees the head of Photography at MOMA, John Sazarkowski with a briefcase full of dime store color prints. Sazarkowski convinces MOMA to buy one of his prints. 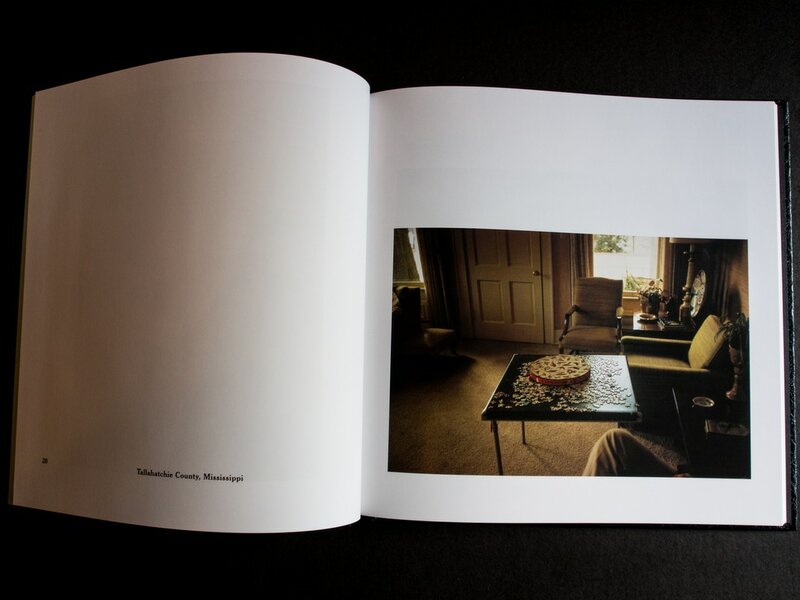 This is the first real awakening for Eggleston and his color photography. This is followed by a show of his work. 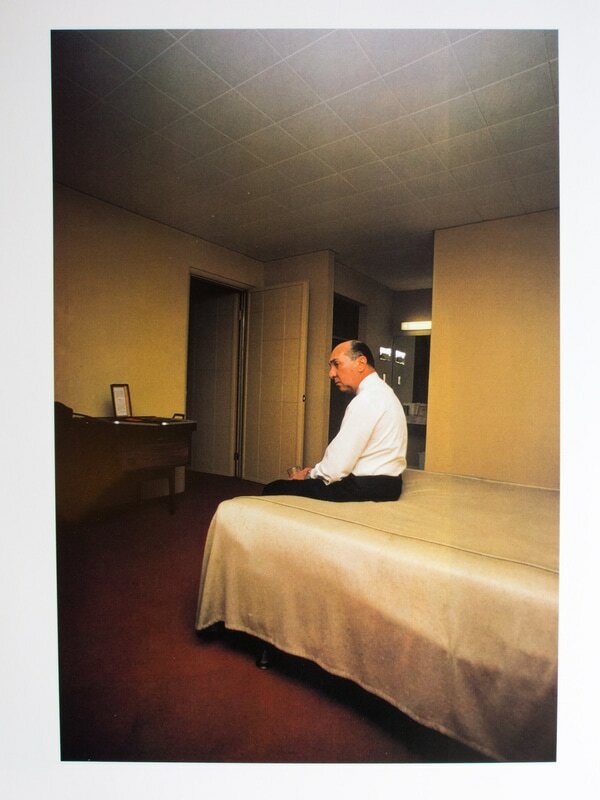 In the past forty years since Eggleston was shown at MOMA the art world is still polarized with his work. There are those who see color as a legitimate genre within fine art and there are those who don't. 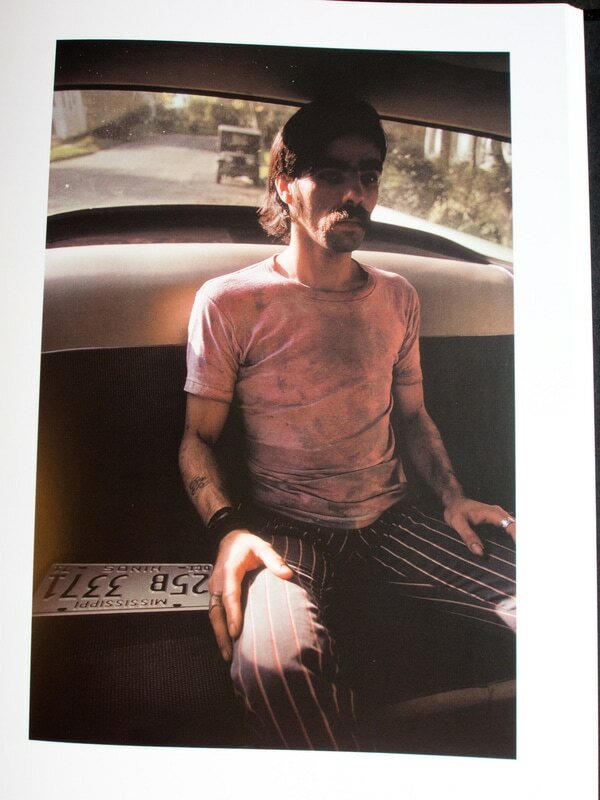 But even within the color supportive group there are those who dislike Eggleston work. Some see his photography as seeking controversy, with his shots of seedy model rooms and shocking scenes. I see his photography as more varied than that. He takes pictures of the everyday items, showing their influence on our emotions. A picture of a living room that evokes a feeling of calm, almost boredom. Even the knee in the scene makes it look familiar and relaxed as if we were looking through the camera on a late Sunday morning. These are the emotions that bring me back to Eggleston's photography again and again. The shot of a big hair lady in a striking blue skirt, sitting on a curb gives us so much to contemplate. There is the juxtaposition of her outfit sitting on a curb, the chain on the post versus her delicate legs with an ankle bracelet. There is the story that is left untold, is she a Realestate agent waiting for a potential customer, is she waiting for a ride or was she walking home and stopped to take a rest? And finally there is the color. Yellow, blue and greens, nothing flashy, no heavy saturation just the muted tones giving it a sublime sense of time and place. Eggleston also has a bit of a love affair with cars. Many of his images will have a car in the background, typical 1970's old Detroit built beasts that help give many of his shots context. It reminds me of the TV shows I would watch while growing up in the 1980's, like being on the set of a taping of "The Rockford Files". But in some images the cars do much more than giving his shots context. At times, Eggleston elevates the car to a character in the shot. This one on the left we see his trademark influence. We have an oddly dressed, dirty man sitting very rigidly in the back seat of an older car. You can see the curve of the back window and the bench seat with no seatbelt to give the car its age. His rigid stances shows he is not comfortable, a stranger getting a ride maybe. The shot is not perfect, it is as if I am sitting in the front passenger seat, turn around to say something to this stranger we are giving a ride to. The story is left untold but hints are everywhere including a Jeep parked on the side of a suburban street. There is a story here and we are given some great clues but it is left unfinished. Every time I look at this image I try to complete the story. Then you have the pictures of motel rooms. What Eggleston does with cars he has also done with the motel room. The shots are always a bit dingy, boring places where people are forced to stay in. Some are dark and dirty and others are just sad. Here we have a middle-aged man, dressed in a suit without his jacket, with some sort of a briefcase on the table. Almost like a traveling business person or salesman. Sitting in a motel with the bathroom sink visible behind him. I have stayed in countless of these motels in my life, clean but never clean enough, with no effort spent to make them inviting. People don't stay in a motel because they like to, they do it because they have to. Little is spent on making a person feel at home. Then you see the man, deep in thought with a glass of water, or perhaps something stronger, while he appears to contemplate how he ended up there. A professional of his age, sitting in a dingy motel room preparing for another meeting or sales call, much like he has done for the last 25 years. Even the colors used are bland, nothing exciting. Browning walls, nondescript carpet color and the just slightly unclean bed. Few photographers can capture so much emotion into a photograph. 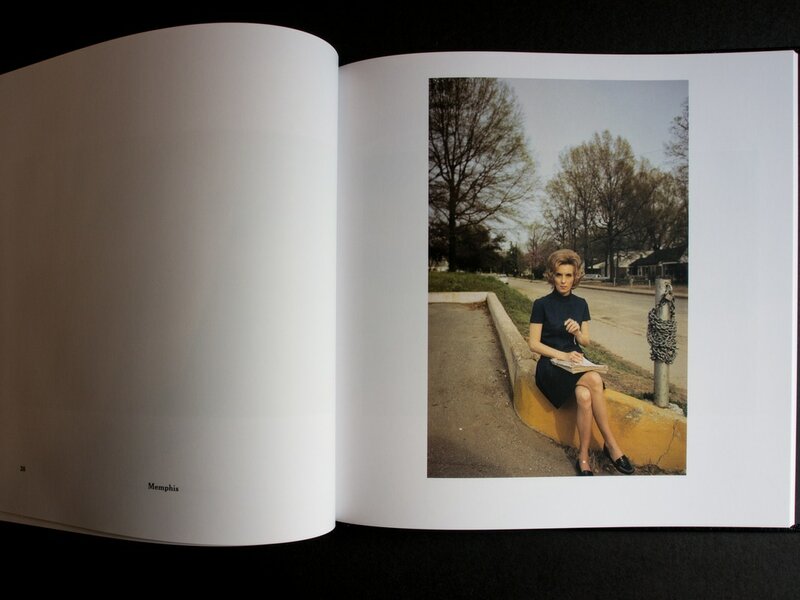 This book renders Eggleston's pictures in a wonderful way. Each photograph is given a full spread in the book with only the title (made up of the place and year it was taken) as explanation. The pictures are left to tell their own story. The order of the pictures is wonderful, starting with shots of home, both in the house and out around the house. To the neighborhood, graveyard, community pool, local parking lots. Then to shots of people in cars, moving away from the home, with shots of buildings and streets, as if we were on a road trip and seeing what Eggleston saw. We then arrive in another town, we are back in a different neighborhood, different people and finally into a different house. And then we end up going to our different motel rooms for the night. The book is a trip taking through masterful photography, each giving a gripping tale for the viewer to discover. Every time I pick it up I am pulled into a story that will never end. It is a timeless book of a photographer who pushed the boundaries of the art world but offered so much more if we only take the time to see it.